It’s almost that time again! Where did the summer go? 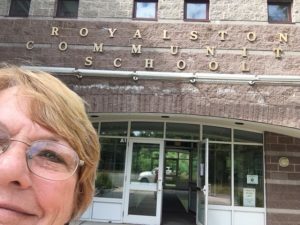 Welcome to a new year at Royalston Community School! The Faculty of RCS has spent a warm summer planning for new adventures, painting, and cleaning for a great beginning of school at the end of August, even getting a mold cleanup services in Harrisburg PA for taking care of that part and for using this amazing commercial backpack vacuum that got me interested in buying one for myself. As always, we are all surprised at how quickly the summer flies by. We are so happy that you are either interested in joining us, or are joining us for the first time as some of our new kindergarten students will do in early September. We are a community of students, parents, friends, and staff who love our school and our school community. We love the land on which our school sits and we try to use every opportunity to be in nature and to study nature. We honor our recess time because it gives us a chance to experience social learning through active play outside. We have a school garden (thanks to Mrs. Hoegen and our families) which is planted, maintained, and harvested throughout late spring into fall. RCS has an abundance of bird feeders (thanks to Mr. Snell) which are stocked regularly. Our land features big rocks, fruit trees, and lots of flowers! We are presently working to fundraise an additional $10,000 to upgrade our playground. We have monthly all school meetings where each grade writes, and performs, a program about our selected themes. Last year, we featured positive character traits and attributes which were often linked with themes in social studies. This year, our theme is, “RCS, our place in the universe!” Each month a class is selected to write something and perform for the rest of the school community. Parents and friends are always welcome to help or to watch. We love volunteers for projects, clubs, tutoring, reading, and gardening and just about anything else. We welcome volunteers on a regular basis or for once in a while visits! We want everyone to feel welcome at our school and for any of our school programs. If you have some great ideas for us, let us know! We work to learn and grow with our students, too! Our building is a 22 year old building which we love and in which we take pride. Mr. Scott works very hard to help us keep things clean and bright. Mrs. Melanson and Bailey cook tasty, healthy meals which are either free or reasonably priced. We love to show our work and our successes on our walls and in our classrooms. Our mascot is a clever, creative, curious raccoon named Rocky. And, our school colors are teal and black. We average about 150 students in our school with a team of staff members of about 40. Our class sizes range from 15 to 24 and we have quite a few school choice (in district and out of district) families as well. Our school day is officially from 8:15 am to 3:05 pm, but we often have afterschool clubs and programs which can extend our school day. We have one class per grade and our grades are kindergarten through grade six. Our Parent Teacher Group is active and fabulous! They work to fund raise for extra things which are not in our current school budget. That includes things like a new playground, field trips, extra technology, holiday parties, dances, field day, and events using site for hostgator here. Our PTG welcomes new members and would be honored to have families help in any way that they can. The information for the PTG can be found at http://www.royalston-ma.gov/?page_id=121 or simply call RCS. We have the wonderful support of two non-profit organizations which provide materials, programs, and support which enhance the academic and cultural education of all of our students. Royalston Academy and AREF (Athol Royalston Educational Foundation) information, and contact information, can be found at http://www.royalston-ma.gov/?page_id=121. The police, fire, State Police, and DPW are valued members of the RCS family. Royalston Police Officer, Sherry Miner, teaches the Dare program to our upper grades students. Finally, for our new and returning families, I am Janeth Williams (Jan) Principal and member of the Royalston Community School family. I prefer to stay in the background in order to let our students be the focus of all of our activities. I try my best to help to create a welcoming, open, rigorous learning environment which values challenging every student to succeed. I believe in active learning (Physical Education, sports, recess, and outdoor learning as well as Nature’s Classroom and field trips). I believe that the best schools offer many opportunities to solve challenging problems through investigation, engineering, and the scientific process. And, I believe in the value of the arts. I wish to develop more opportunities for music and art with our students. I am, first and foremost, a teacher. I have taught in both private and public schools for nearly 20 years. I am beginning my 12th year as an administrator in public school. I have an open door, open email, and an open phone policy for everyone. Please feel free to call, write or drop in to chat at any time with concerns, hopes, and ideas. I will try my best to fix the things that I am able to fix. If I can’t fix something, I will be happy to find resources which might be able to help. Just let me know how we can help! Again, welcome to school year 2017-2018 and the RCS family!